It was Kung Fu Panda lunch time for the boy the other day. Unfortunately, I forgot to take a picture of the box closed since it is a Kung Fu Panda box. Inside was full of other panda themed goodies. Ben had a panda sandwich--ham and cheese on honey wheat, cut with a CutezCute cutter. Because of the size, I was able to save the bread edges to make egg in a hole on the weekend. 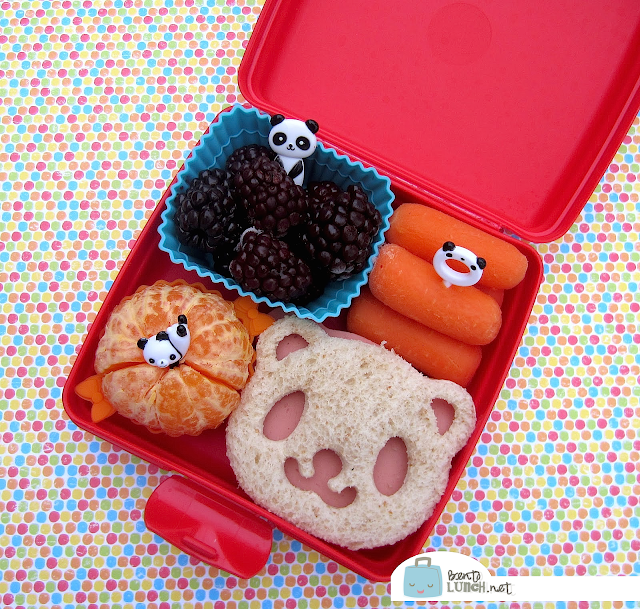 To go with his panda sandwich, he has carrots with a panda pick, frozen blackberries with a panda mini fork, and a Cutie orange with a different panda pick. This box is actually a Tupperware brand sandwich box, it holds more than you'd think! So cute! We love pandas here. I want one of those cuteZcute cutters real bad but they are out of stock at allthingsforsale.com and won't be back for like over 2 weeks. Oh the suspense! It's killing me!